20th Century Treasure! One set. Four historic 90% silver U.S. Half Dollar designs! Struck for circulation by the U.S. Mint from 1794 until 2002, the American Half-Dollar is now one of the most collected U.S. coins. It's a coin that's all but disappeared from our pocket change today. But, its last four circulating designs stand out as historic mile markers for the 20th Century. From the anticipation of a new century, through the terrors of World War I ... through the highs of the Roaring Twenties and the lows of the Great Depression. From home front rationing during the Second World War to the post-war prosperity that followed in the 1950s and '60s, the U.S. Half-Dollar design changed with the times. 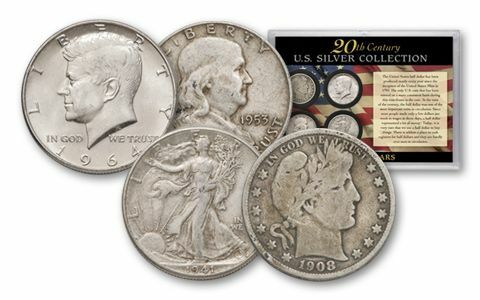 This 20th Century Silver Half Dollar Collection features four iconic American designs - each in 90% silver. First, the 1900-1915 Barber Half-Dollar: The namesake of the U.S. Mint's sixth Chief Engraver Charles Barber, his classic design was first struck in 1892 - and was still in in circulation long after WWI. Second, the 1916-1947 Walking Liberty Half-Dollar: A coin that circulated during the Roaring Twenties, the Great Depression and the Second World War; its design was so popular, that the mint used it again for the new Silver Eagle Dollar in 1986. Third, the 1948-1963 Franklin Half-Dollar: Featuring the familiar face of Founding Father Benjamin Franklin, this post-war series was only struck for 16 years; it was replaced in haste after the assassination of President John F. Kennedy.Lastly, the 1964 Kennedy Half-Dollar: Circulation of this coin honoring JFK began only months after his tragic death. 1964 would be the last year a circulating U.S. Half-Dollar was struck in 90% pure silver - and the mint would cease production of ALL circulating Half-Dollars in 2002. Assembling a collection like this is no easy task. 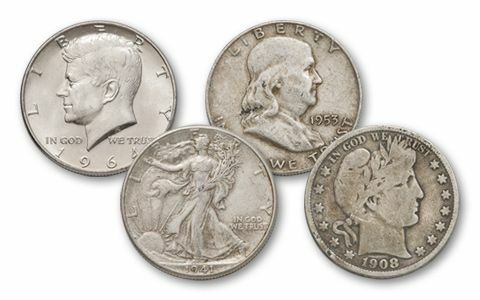 Melted for their silver or worn out in circulation, the remaining population of each coin just gets smaller and smaller with every passing year. 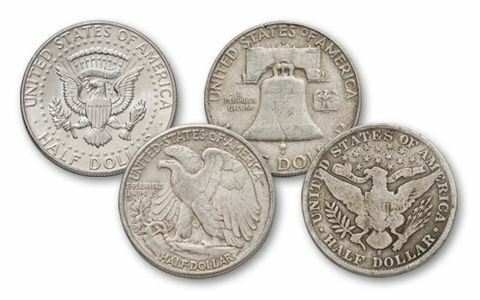 But, now you can own ALL FOUR of these historic U.S. Half-Dollar designs in a single set! 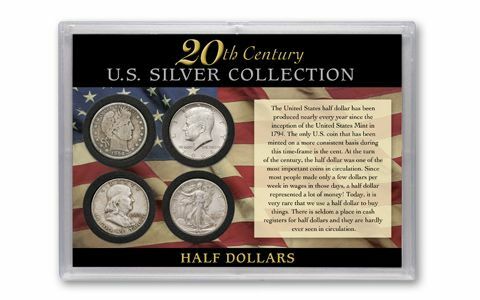 Just hurry - only a limited number of these 20th Century Half-Dollar collections are available. Order yours now!